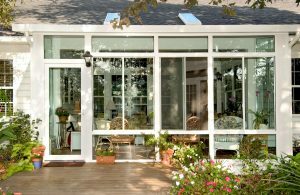 The innovative all-season sunroom additions installed by SRA Home Products at homes throughout Egg Harbor Township, New Jersey, offer benefits that cannot be matched by traditional “stick-built” home additions. In the past, many sunrooms could only be used for a small portion of the year, as dropping winter temperatures would force families to retreat to other areas of the house. As a result, families who were looking to expand their living space might have been more inclined to build traditional home additions that they could use all year long. These features can help you and your family remain cool on hot summer days and warm on cold winter days. In addition, the cost required to install one of our all-season sunroom additions is often considerably less than the price of a traditional home addition. Plus, whereas a traditional home addition might take weeks or even months to complete, we can often install our sunroom additions in as little as one day, thanks to their exclusive snap-fit design. Many homeowners assume that they won’t be able to customize a sunroom to the extent they would a traditional home addition. While many NJ sunroom additions are built using a standard, cookie-cutter design, that isn’t the case with our sunrooms. When you turn to SRA Home Products for a sunroom addition, you’ll be able to select from various styles. One of our most popular style choices is the cathedral model, which features vaulted ceilings that make the room feel significantly larger without taking up any additional floorspace. And, for homeowners desiring additional sunlight, we also offer California and solarium models. The California style features a contemporary split-level design and the solarium style comes with a polycarbonate roof, both of which let in extra natural light (the solarium option is ideal for homeowners who enjoy stargazing!). We also offer a Santa Fe model that features pergola trim along the perimeter of the roof. And, homeowners in need of a versatile setup will love our studio model, which is available in one-, two-, three-, and return-wall configurations. And, for NJ homeowners desiring sunroom additions with even more opportunities for customization, we also offer sunrooms from TEMO’s Nino Vitale Signature Collection. These sunroom additions can be further customized so that they blend into the existing architecture of your home. If your home was built using brick, for instance, we can install matching brickwork on your new sunroom so that it matches the exterior walls. We also offer matching siding and roofing, knee walls, and much more. If you’re interested in adding extra living space to your Egg Harbor Township, NJ, home but are concerned about the time and expense associated with a traditional home addition, please call SRA Home Products today so that we can discuss with you the benefits of our state-of-the-art all-season sunroom additions.